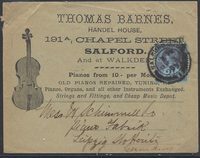 1886 2½d Lake with 'BROWNE, ROSENHEIM & CO/LONDON' Advertising Ring in Blue. Envelope addressed to Belgium and cancelled by a very fine London cds. Circa 1880 Postal Stationery ½d Vermilion with "SAVORY AND MOORE/LONDON" Advertising Ring. Superb Unused. 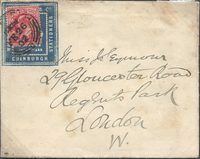 1879 Advertising Envelope from Canada to Preston, "PAID/LIVERPOOL/US PACKET", Robs S14. 1907 1d Rose-Red, SG 43, Plate 198, tied to commercial envelope to London by a very fine LEICESTER cds - A VERY LATE USE OF THE 1d ROSE-RED.